This week was slightly more exciting than the last because Kaitlin was finally gone… I guess she left to look for her daughter (last seen in a deleted town :/) elsewhere. Crazy Redd came as usual on Monday, finally stocking a cabin chair after Kammile already ordered one for me, and on Tuesday I heard the wonderful noise of Gulliver’s UFO! After seeing two shooting stars in a very short timespan, I figured something was up and put away my tools. And wow, I’ve never seen so many in one night before! Sometimes there were two or three practically in a row, and even during less busy periods of time I didn’t have to wait too long to see another one. When I was watering my blue pansy breeding area, I saw a new house there belonging to my new neighbor to replace Maple: Nan! I can understand Nan’s nervousness, it was late. xP I really like her house, she seems studious. Here’s a full picture of her house once I set up a path to it. This is my favorite house location in Dafdilly, I’m so glad someone lives here again! Before I could give it to him, I had to leave it outside and have all of my characters touch it since one of my long-term AC:WW goals is to complete all my characters’ catalogs. Twisk’s fossil section is full because she dug them all up, and I thought my secondary characters had touched everything, but I guess they all missed the seismo skull somehow. 😛 I’ll keep an eye out for it and then I’ll never have to worry about fossils in Dafdilly again, they can go straight to Nook. I saw Dr. Shrunk frolicking there (and running through flowers :evil:) later today. Twisk was offered to learn sorrow, approval, confusion, or discontent. I had a hard time deciding whether I wanted to learn approval instead of shock or something, but in the end figured that I already have two happy emotions, so a little variety (shock, shyness) is good. Bell’s choices were sorrow, distress, thought, and anger. She learned sorrow and forgot disappointment, a good swap I think. Melody also learned laughter! 😛 I just really love that emotion, I wish Twisk would learn it. Acceptance, realization, and sorrow were the other three choices for her. I’m excited for tomorrow to see what my town looks like with the coming of October and its changes into fall colors! Hopefully my paths won’t look too bad. 😛 I’ll try to put up October’s information as soon as possible! 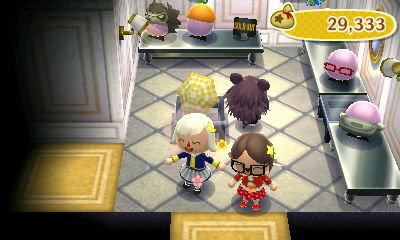 Posted on September 30, 2011 by Amy •	This entry was posted in AC:WW, Dafdilly and tagged Animal Crossing. Bookmark the permalink. Exactly how I feel every time he says that! Wow, that field of red pansies and fruit trees is really eye-catching! Ooh, I look forward to seeing what my own town looks like! Haven't played yet today. 😛 It's the flea market, too, so maybe I'll try to make some bells. Yeah, I would appreciate the grass changes a lot more if I didn’t have to change my side paths every time. 😆 I still don’t know how I’m going to blend them in with the Fall grass. There aren’t any appropriate colors on palette 12, the one that has the dirt colors. I like to differentiate between paths that go to my neighbors’ houses and paths that go somewhere important, like the town hall or museum, so that’s why I like to do a stepping stone type thing for the side paths. I often hang around outside and near the top of town if I notice that there aren’t any special visitors (he often comes pretty soon after you start your game), so it’s a bit easier that way and now that I have the golden slingshot. 😛 I’m always hopeful for a statue or something! But it has nothing close to a dirt color or a brick color that matches those of palette 12. 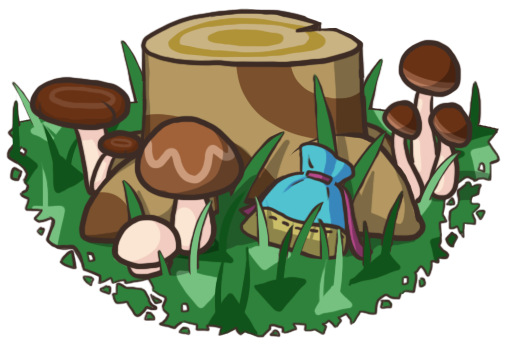 😦 Looks like I’m going to have to try something else, though my current side paths don’t look as horrid with this grass change as my previous ones did in this post, so I might take my time a bit in figuring out what to replace them with. Lately I’ve been really wishing they’d introduce a “transparent” palette colour 😛 One that will just let whatever’s underneath the pattern show through. Cos by the time you’ve done the grass or the ground, there’s not many colours left for you to actually draw the thing that was meant to be the whole point of the pattern. Wow, that’s a good idea I’ve never thought of! The least they could do is provide suitable palettes with all the grass colors. 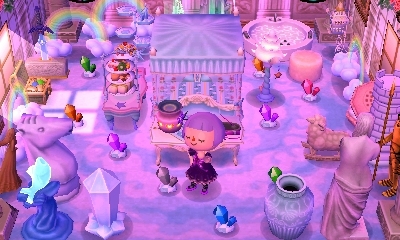 😛 I’m hoping for more pattern options (colors, storage, and more features) in AC:3DS! And it is hard as they’re no season fossils like there are with bugs and fish, but I still think the painting exhibit is the hardest! Yeah, at least you have some control over the fish and bug exhibits; it all depends on how hard you work on catching everything each month. But fossils and paintings on the other hand… Especially the paintings, it’s such a painful ordeal to collect all of them! The only reason I have so many is because I used my original character’s catalog (the one who lived in my first AC:WW town, Cutetown :lol:, made around Christmas 2005). I love art history and hated having such an empty painting exhibit after I’d collected so many before. 😦 Teru also helped me out with two paintings! Last night I was still laying down my paths and I kept setting the date a day at a time… Now I have I think 8 hybrids…. Mostly pink and orange, and one black tulip. Is it true that yellow and yellow tulips = a black tulip? I heard that somewhere and I’m trying it. I’m not sure if it works though. I got the black tulip I have from my red x red area. Wow, congratuations on the hybrids! That’s how I started out too in this town, I kept getting pink, orange, and black. Yeah, strangely both yellow x yellow tulips and red x red tulips produce black tulips! I’ve spawned black tulips both ways. ……OH! Yes I don’t remember XD….. new theme, new post, new page on my blog! Yeah, I miss Kammile, too, but she left a comment on her latest post saying that her internet was down and that she was in an internet cafe, so it’s not her fault. Oh ok! Hope Kammile recuper the internet! and back to the blog again! I told you Emma! What did I say to you when you asked about Kammile? I’ve also been preparing for the Acorn Festival and I hate the way my town looks because of it (missing flowers and path patterns :(). I’m trying to regrow the hybrids, Good thing i planned my hybrids spots before this tragic thing happens.. a 2 day abandonment on my game… that’s a little bit too much,right?